This article is intended for philosophers and logicians as a short partial introduction to category theory (CT) and its peculiar connection with logic. First, we consider CT itself. We give a brief insight into its history, introduce some basic definitions and present examples. In the second part, we focus on categorical topos semantics for propositional logic. We give some properties of logic in toposes, which, in general, is an intuitionistic logic. We next present two families of toposes whose tautologies are identical with those of classical propositional logic. The relatively extensive bibliography is given in order to support further studies. Abramsky, S. i Coecke, B., 2008. Categorical quantum mechanics. arXiv: 0808.1023. Angot-Pellissier, R., 2015. The Relation Between Logic, Set Theory and Topos Theory as it Is Used by Alain Badiou. W: Koslow, A.i Buchsbaum, A. red. The Road to Universal Logic, vol. II, Studies in Universal Logic. Birkhäuser, Springer, Cham, ss. 181–200. Awodey, S., 1996. Structure in Mathematics and Logic: A Categorical Perspective. Philosophia Mathematica, 4(3), ss. 209–237. Awodey, S., 2004. An Answer to Hellman’s Question: „Does Category Theory Provide a Framework for Mathematical Structuralism?” Philosophia Mathematica, 12(1), ss. 54–64. Awodey, S., 2010. Category Theory, Oxford Logic Guides. OUP Oxford. Bell, J.L., 1981. Category Theory and the Foundations of Mathematics. British Journal for the Philosophy of Science, 32(4), ss. 349–358. Bell, J.L., 1986. From Absolute to Local Mathematics. Synthese, 69(3), ss. 409–426. Bell, J.L., 2004. Whole and Part in Mathematics. Axiomathes, 14(4), ss. 285–294. Dostępne na: https://doi.org/10.1023/B:AXIO.0000024887.61543.63. Bell, J.L., 2008. A Primer of Infinitesimal Analysis. Cambridge University Press. Bondecka-Krzykowska, I. i Murawski, R., 2008. Teoria kategorii we współczesnej filozofii matematyki. W: Heller, M., Mączka, J., Polak, P. i Szczerbińska-Polak, M. red. Prawa przyrody. Ośrodek Badań Interdyscyplinarnych – Polska Akademia Umiejętności – Uniwersytet Jagielloński – Biblos, ss. 95–109. Dalen, D. van, 2002. Intuitionistic Logic. W: Gabbay, D. i Günthner, F. red. Handbook of Philosophical Logic. 2 wyd. T. 5. Dordrecht: Kluwer, ss. 1–114. Döring, A. i Isham, C., 2011. „What is a Thing?”: Topos Theory in the Foundations of Physics. W: Coecke, B. red. New Structures for Physics. T. 813, Lecture Notes in Physics, Berlin Springer Verlag, ss. 753–937. arXiv: 0803.0417 [quant-ph]. Dummett, M., 2000. Elements of Intuitionism, Oxford Logic Guides. Clarendon Press. Eilenberg, S. i Mac Lane, S., 1942. Group extensions and homology. Annals of Mathematics, 43, ss. 757–831. Dostępne na: https://doi.org/10.2307/1968966. Eilenberg, S. i Mac Lane, S., 1945. General theory of natural equivalences. Transactions of the American Mathematical Society, 58, ss. 231–294. Goldblatt, R., 2006. Topoi: The Categorial Analysis of Logic, Dover Books on Mathematics. Dover Publications. Grothendieck, A., 1957. Sur quelques points d’algèbre homologique. Tohoku Mathematical Journal, 9(2), ss. 119–221. Dostępne na: https://doi.org/10.2748/tmj/1178244839. Heller, M., 2015. Category Theory and the Philosophy of Space. W: Murawski, R. red. Filozofia matematyki i informatyki. Copernicus Center Press, ss. 185–200. Heller, M., 2016a. Category Free Category Theory and Its Philosophical Implications. Logic and Logical Philosophy [Online], 25(4), ss. 447–459. 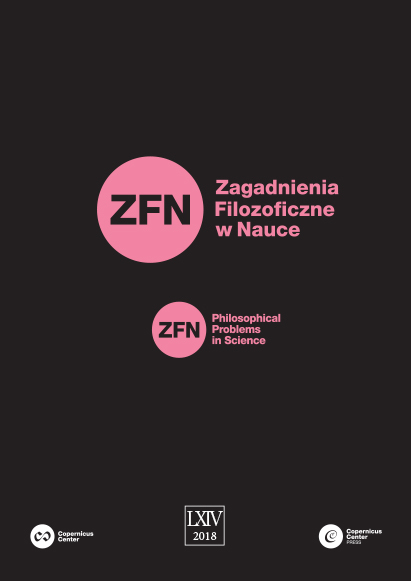 Dostępne na: https ://doi .org/arXiv:1602.01759 [ostatni dostęp: marzec 2018]. Heller, M., 2016b. Teoria kategorii, logika i filozofia. Filozofia Nauki, 94, ss. 5–15. Heller, M. i Król, J., 2017a. Beyond the Space-Time Boundary. arXiv: 1711.09027. Heller, M. i Król, J., 2017b. Gravity in the smallest. arXiv: 1706.03541. Heller, M. i Król, J., 2017c. Infinitesimal Structure of Singularities. Universe, 3, s. 16. Hellman, G., 2006. What is Categorical Structuralism? W: Benthem, J. van, Heinzman, G., Rebushi, M. i Visser, H. red. The Age of Alternative Logics. Springer, ss. 151–161. Heyting, A., 1971. Intuitionism. Amsterdam: North-Holland Pub. Co.
Isham, C.J. i Butterfield, J., 1999. Some Possible Roles for Topos Theory in Quantum Theory and Quantum Gravity. arXiv: gr-qc/9910005. Kan, D.M., 1958. Adjoint Functors. Transactions of the American Mathematical Society, 87, ss. 294–329. Kock, A., 2006. Synthetic Differential Geometry, London Mathematical Society Lecture Note Series. Cambridge University Press. Król, Z., 2006. Platonizm matematyczny i hermeneutyka. Wydawn. IFiS PAN. Król, Z., 2011. Platonizm w matematyce a platonizm w naukach matematyczno-przyrodniczych. W: Ługowski, W. i Lisiejew, I. red. Filozofia przyrody dziś. Philosophy of Nature Today. Wydawn. IFiS PAN, ss. 108–114. Landry, E., 2018. Categories for the Working Philosopher. Oxford University Press. Landry, E. i Marquis, J.P., 2005. Categories in Context: Historical, Foundational, and Philosophical. Philosophia Mathematica, 13(1), ss. 1–43. Lawvere, F.W., 2005. An elementary theory of the category of sets (long version) with commentary. Reprints in Theory and Applications of Categories [Online], 11, ss. 1–35. Dostępne na: [ostatni dostęp: marzec 2018]. Lawvere, F.W. i Rosebrugh, R., 2003. Sets for Mathematics. Cambridge University Press. Lawvere, F.W. i Schanuel, S.H., 1997. Conceptual Mathematics: A First Introduction to Categories. Cambridge University Press. Leinster, T., 2014. Basic Category Theory, Cambridge Studies in Advanced Mathematics. Cambridge University Press. Mac Lane, S., 1988. Concepts and Categories in Perspective. W: Duren, P.L., Askey, R. i Merzbach, U.C. red. A Century of Mathematics in America. T. 1, A Century of Mathematics in America. American Mathematical Society, ss. 323–365. Marquis, J.P., 2009. From a Geometrical Point of View. A Study of the History and Philosophy of Category Theory. Springer, Netherlands. Marquis, J.P., 2015. Category Theory. W: Zalta, E.N. red. The Stanford Encyclopedia of Philosophy [Online]. zima 2015. Metaphysics Research Lab, Stanford University. Dostępne na: . McDonald, D., 2012. Anti-Foundational Categorical Structuralism. Praca doktorska. The School of Graduate i Postdoctoral Studies, The University of Western Ontario. McLarty, C., 1990. The Uses and Abuses of the History of Topos Theory. British Journal for the Philosophy of Science, 41(3), ss. 351–375. Moerdijk, I. i Reyes, G.E., 1991. Models for Smooth Infinitesimal Analysis. Springer-Verlag. Mormann, T., 2009. Updating Classical Mereology. W: Glymour, C., Westerstahl, D. i Wang, W. red. Logic, Methodology and Philosophy of Science. Proceedings of the 13th International Congress. King’s College. Mormann, T., 2010. Structural Universals as Structural Parts: Toward a General Theory of Parthood and Composition. Axiomathes, 20(2-3), ss. 229–253. Peruzzi, A., 2006. The Meaning of Category Theory for 21st Century Philosophy. Axiomathes, 16(4), ss. 424–459. Rasiowa, H. i Sikorski, R., 1963. The Mathematics of Metamathematics, Monografie Matematyczne. Warszawa: Państwowe Wydawn. Naukowe. Semadeni, Z. i Wiweger, A., 1972. Wstęp do teorii kategorii i funktorów, Biblioteka matematyczna. PWN. Simmons, H., 2011. An Introduction to Category Theory [Online]. Cambridge University Press. Dostępne na: [ostatni dostęp: marzec 2018]. Skowron, B., 2015. Proteuszowy charakter matematyki w ujęciu Sandersa Mac Lane’a. W: Murawski, R. red. Filozofia matematyki i informatyki. Copernicus Center Press, ss. 201–217. Smith, P., 2016. Category Theory: A Gentle Introduction [Online]. Skrypt, University of Cambridge. Dostępne na: [ostatni dostęp: marzec 2018]. Takeuti, G., 1978. Two Applications of Logic to Mathematics. Princeton University Press. Troelstra, A.S. i Dalen, D. van, 1988. Constructivism in Mathematics. T. 1, 2, Studies in Logic and the Foundations of Mathematics. Elsevier Science. Zawadowski, M., 2012. Elementy teorii kategorii [Online]. Skrypt, Uniwersytet Warszawski. Dostępne na: [ostatni dostęp: marzec 2018].